La Fresh is a company that makes a difference in people's lives through it's performance, convenience, and conscientiousness. They offer a line of beauty products and travel items that contain exceptional ingredients and deliver chic style with less substance. Not only do they want to keep every human fresh but they want to give you a product with great value and keep the environment in mind! They believe that fresh water is one of the world's most precious commodities and in the beauty industry it's very common for skin care products to contain up to 90% water! And half the time you need your own tap water to make the product work! That's a lot of energy and water that is being wasted. So La Fresh makes their products light so they don't require much energy to ship them and they make sure that each product contains only a little water per use and doesn't really require extra water to work. And of course, their products are made of biodegradable materials that give back to the earth in a very responsible way! So here is what I received from La Fresh and also what I thought of each item! 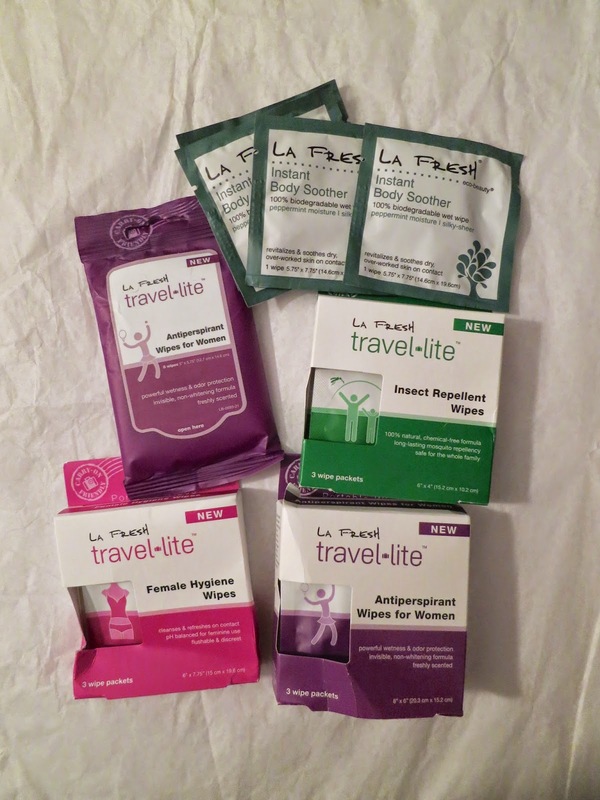 Antiperspirant Wipes for Women - I got the pack of 8 wipes as well as the Travel Lite pack. These are great for on the go when you are breaking into a sweat and you don't want to be embarassed if you have to stand near other people. They are great for in your gym bag, purse, or in your carry on bag. They immediately make me feel refreshed and clean! Insect Repellent Wipes - not only are these as effective as DEET but they are 100% natural and chemical-free. They are safe for the whole family and are great to bring along when you know you'll be outside for an extended period of time. No need to worry about mosquito bites with these in your picnic basket! They really do work everytime I use them! Female Hygiene Wipes - These wipes are pH balanced to keep you fresh and clean down there no matter what the reason. They even contain aloe! And they are flushable! It's a great way to discreetly stay fresh! Instant Body Soother - I love using these after a long day when I need a pick me up. I love the natural peppermint and the 6-oil blend that gives it a lovely smell. A great way to freshen up for any reason! I highly suggest you invest in these for all your beauty needs!